Veľkosť tohoto PNG náhľadu tohoto SVG súboru: 800 × 411 pixlov. Iné rozlíšenia: 320 × 164 pixlov | 640 × 329 pixlov | 1 024 × 526 pixlov | 1 280 × 657 pixlov | 2 000 × 1 027 pixlov . Español: Mapa de los Estados miembros de la OCDE. 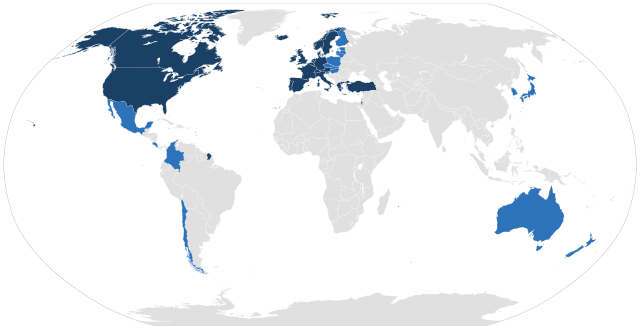 Français : Pays membres de l'OCDE. Italiano: Stati membri dell'OCSE, in blu scuro gli stati fondatori. Português: Os membros da OCDE estão indicados a azul. Australia, Austria, Belgium, Canada, Chile, Colombia, Czech Republic, Denmark, Estonia, Finland, France, Germany, Greece, Hungary, Iceland, Ireland, Israel, Italy, Japan, South Korea, Latvia, Lithuania, Luxembourg, Mexico, Netherlands, New Zealand, Norway, Poland, Portugal, Slovak Republic, Slovenia, Spain, Sweden, Switzerland, Turkey, United Kingdom, United States. Zdroj Vlastné dielo. *Derived from by Emuzesto, released under CC-BY-SA-2.0. *Map derived from as of version 14 August 2014. *Coloured using Inkscape. 02:43, 31. máj 2018 863 × 443 (1,6 MB) JShark Colombia became a full member. Lithuania became a full member. 16:25, 3. apríl 2016 863 × 443 (1,6 MB) FlavianusEP Colored Greenland as a found member as it is part of Denmark. 23:13, 14. august 2014 1 405 × 601 (199 KB) Rfassbind Low resolution world map. 90% smaller w/o thousands of islands that need to be colored correctly, but in turn this file is SVG-valid. Based on: verion BlankMap-World gray.svg as of 14 August 2014. Color palette unchanged.